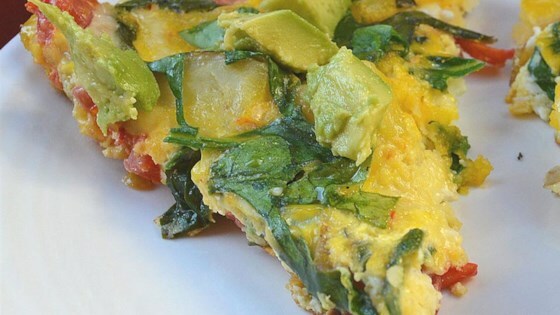 "A simple frittata for the whole family. You may substitute your favorite sausage for ham in this recipe if you wish." Bring a large pot of salted water to a boil. Add potatoes and cook until tender but still firm, about 5 minutes. Drain and set aside to cool. Meanwhile, preheat oven to 350 degrees F (175 degrees C). In a cast iron skillet, heat oil over medium heat. Add onions and cook slowly, stirring occasionally, until onions are soft. Stir in eggs, drained potatoes, ham, salt and pepper. Cook until eggs are firm on the bottom, about 5 minutes. Top frittata with shredded cheese and place in preheated oven until cheese is melted and eggs are completely firm, about 10 minutes. See how to make a simple breakfast frittata with bacon, potatoes, and chard. Used this as a base recipe. Used 4 egg whites, 4 eggs, turkey bacon, garlic, parsley,mushrooms,green onion, spices, cheddar cheese, 5 potatoes. Really tasty, easy and good. very good-i found that adding some worchestershire sauce to the eggs helped bring out the flavours. When sauting the onions, I added some fresh chopped broccoli and some chopped green bell peppers. Very good, easy to make and ohhhh so delicious. Will repeat this for sure!